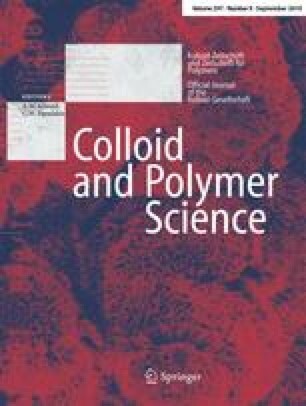 The surface viscoelastic properties of monolayers of two phospholipids DPPC (L-α-dipalmitoylphosphatidylcholine) and DMPE (L-α-dimyristoylphosphatidyl-ethanolamin), at the air-water interface have been investigated. Two techniques were used for the investigation. One involved use of an interfacial shear rheometer (torsion pendulum apparatus ISR1), to provide measurements of the shear viscosity ηs as a function of surface pressure, and the second, a modified LB trough with an oscillating barrier to generate periodie dilation and compression so as to measure the dilational elastic modulusE as a function of surface area. Results indicate a strong dependence of ηs andE upon monolayer phases. This suggests that the viscoelastic relaxation of monolayers can be understood as molecular rearrangements, domain exchange and molecular reorientations between different monolayer states.